George Holloway has spent his life alone, exploring the treacherous beauty of the Colorado Rockies. He's the best survival expert Search and Rescue has, which makes him the obvious choice to lead Ellie Price through deadly terrain to find her missing father. There's just one problem—Ellie's everything George isn't. She's a city girl, charming, gregarious, delicate, small. And when she looks up at him with those big, dark eyes, he swears he would tear the world apart to keep her safe. Ellie Price lives in Chicago, and while out on a date she receives a call from her dad. For most people this is nothing strange, but for Ellie it makes her nervous. Her dad has been fighting his inner demons for as long as she can remember. When he tells her that someone is after him and wants to kill him, she has to save him. The only clue she has is he is headed to her grandfather’s cabin. That cabin is located in the Rocky Mountains of Colorado. She hasn't been to the cabin since she was 10 years old, so she can't remember how to get there. So she will need a guide. And that is where George Holloway comes in, he is part of the search and rescue team and knows the mountains like most people know the backs of their hands. With George leading the way, she is in good hands. George doesn't talk much, but he sure looks good to Ellie. Can Ellie and George stay ahead of the people looking for Baxter Price? What will happen if they reach the cabin and find Baxter? Will George and Ellie give into their feelings for each other? And OMG that last chapter, you have to read it. I need more now, please. This is an exciting, though slightly messy, mountain adventure. I enjoyed the pairing of the city girl with the mountain woodsman and some of the action sequences were exciting. While I enjoyed the idea of Ellie and George together, I really never felt that either character was developed thoroughly enough for me to really invest in the couple and their relationship. I liked them both, but I didn’t care very deeply about either of them. The action scenes are exciting, though I did find myself skipping pages as Ellie and George trek through the snow on their first adventure – each new page seemed to bring another detailed lecture in mountain survival. Ellie’s confidence is enjoyable, and her skills with weapons are remarkable for a city girl. My biggest frustration with this story was the series of narrative threads that were picked up and seemingly dropped before they were fully developed. The story with Ellie’s father becomes confusing and doesn’t resolve, the story with Joseph just ends without concluding. There is a cliffhanger ending which is always less than satisfying, but other elements of this story are just...left. I really enjoyed the Colorado setting. The snow provides an original, dangerous environment. I liked the small town, though I wish characters in the town had been more fully developed and more easily recognisable. Parts of this story were exciting, but I’m not sure I will continue with the series. With too much time focused on mountain survival skills and too little time spent thoroughly developing characters and plot line, the story left me frustrated. I have read the previous books and really enjoyed them – this is at least as good! There is an underlying mystery running through the books – and not resolved yet, although seriously intriguing ending – which means that you definitely should read them in order and I assure you, enjoy every minute. There is a wonderful feeling of wilderness and off the grid about Simpson, which is then tempered with the local meth dealers and a recent murder. The search and rescue team are all larger than life, and yet each has some quality which makes them immediately recognisable and appealing (well maybe not Joseph). This story is based around George, the silent but gorgeous one and new into town, Ellie, who is trying to track down her father. The interactions between these two very likeable people are wonderful, and get better. The humour between them, the dangers they encounter, the care, and ultimately the dependence on each other is really well written, and engrossing reading. Some of the scenes (getting sorted out in the tent in the snow) were so vivid, that I was trying out the actions in my head, seeing how it could work. Such precious moments between two people in difficult circumstances ensured I kept turning the pages late into the night. Rest assured this is more than a mystery, more than a romance, more than an outdoor adventure – I highly recommend it to you. For reviews & more info, check out our Fan the Flames post. 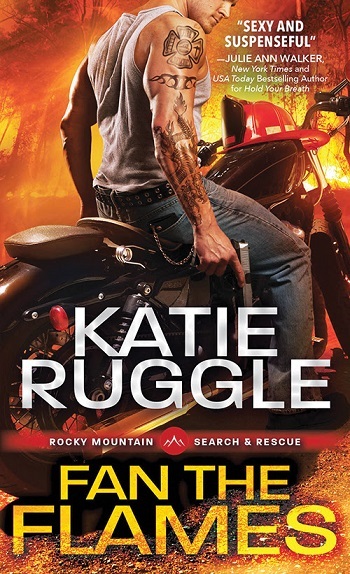 Reviewers on the Wicked Reads Review Team were provided a free copy of Gone Too Deep (Search and Rescue #3) by Katie Ruggle to read and review.